Britton Wilson certainly was the highlight of VA's high school action up at the Armory but she certainly was not the only one making big waves. She also was not the only one coming away with a gold medal either. 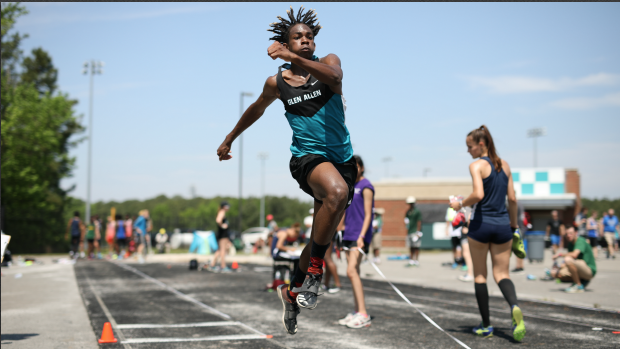 Mason Henry of Glen Allen also took home the gold with his 49-8.5 jump in the triple. That is his third time this indoor season having jumped over 49 feet. VA also had a couple second place finishers as well. In the pole vault we had Gennifer Hirata clear 13-3.5 for second and Loudoun Valley go 7:52 in the 4x800 without Sam Affolder who finished 4th in a very fast 4:09. Finishing out the podium finishers for Virginia was Keyonte Midgett in the TJ (48-8), West Springfield Boys in the 4x8 (7:53), Highland Springs Boys in the 4x2 (1:29.9), and South County Girls in the 4x2 (1:39.3).